Are you having trouble maintaining your lawn? Lawn care isn’t easy. The growing seasons in the Northwest fall on a continuum. A longer winter can lead to grass seed dormancy. An over wet spring and you’re facing a different problem. This natural volatility can make it difficult to grow and maintain a lawn in Vancouver WA, but it doesn’t have to be. The professional landscapers at Urban Eden Landscaping can help you achieve the lush and full lawn you really want. Not only that, we’ll maintain it for you too. None of the work, all of the enjoyment, and a lawn you can be truly proud of. 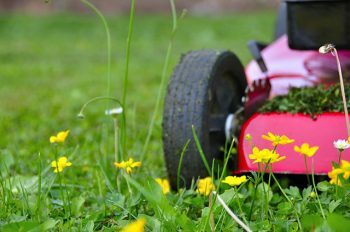 Take back control of your lawn! Lawn mowing service: We can mow to a specified length to meet your or your HOA’s expectations. Grass treatments: Our technicians can apply growth fertilizer to help your lawn flourish any time of year. Lawn aeration: This is particularly beneficial for damaged lawns. Aeration allows water, air, and additives to make it to the root structure..
Weed control: Nothing ruins a lawn like weeds. We treat for native and non-native weed species. Lawn repair: If your lawn has been damaged our repair services can bring it back to life again. Contact us for lawn maintenance services today! You should enjoy your lawn. If it’s gotten unruly, maintenance is a chore you no longer want, or you need help regrowing it, just call or contact us today. Local lawn maintenance starts with Urban Eden Landscaping in Vancouver WA. We guarantee our services and put in the work to make your lawn lush, full, and strong.